How to Reduce Weeds in the Vegetable Garden by using a Stale Seed Bed. A stale seed bed reduces the number of weeds which have to be controlled when the vegetable seedlings start to grow in the garden. 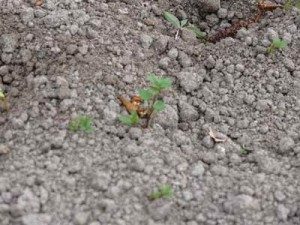 What is a stale seedbed? A stale seed bed is a seedbed which has been prepared, & given a false start, some weeks before the seed is due to be sown. Any weed seeds in the bed will be encouraged to grow, so that they can be raked out & killed before the actual vegetable crop crop is sown. * the number of weed seeds which have to be controlled, when the vegetable seeds start to grow, is reduced. * competition, for light, food, water & space, between the vegetable seedlings & weeds will be reduced, by reducing the number of weeds. * there will be a wider window for hand weeding between the egetable plants if there are not many weeds. It is not so crucial to weed them out immediately, which is important for weekend gardeners. * the seedbed will be more even, as it has had time to settle down and the moisture will have spread out. Thus germination will be more even. * encourage weed seed germination by keeping the soil damp, either with rain, or with gentle watering (gentle because do not want to destroy the structure of the seed bed.) Use a very fine rose on the watering can. * Do not over-water or the seedbed will become structureless or hard. 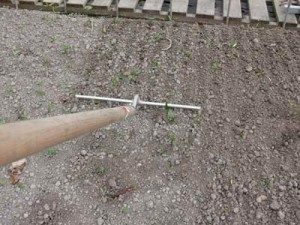 * just as weed seedlings are emerging through the soil, gently rake the bed in dry weather, so that the weed seedlings are disturbed and destroyed. Rake when the weeds are at the cotyledon (seed-leaf) stage. Seedlings are vulnerable then, because they are changing from being dependent on the seed for food to becoming reliant on the roots for survival. * do not allow the weeds to get too big because the root system will be well developed and difficult to kill. * allow a few days for the disturbed weed seedlings to die, then sow the vegetable seed in the normal way. The stale seed bed system of weed control is only practical on light, sandy soils. It is not recommended for clay soil. 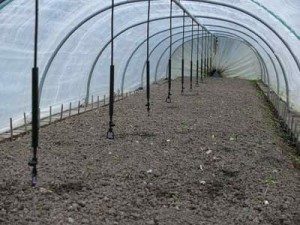 The stale seed bed system will not eliminate weeds completely, but will reduce the number of weeds germinating at the same time as the vegetable seeds.